The CEIC is a one-of-a-kind certification course that will provide you with the tools and ready-to-use materials to begin offering interview coaching within one review. Gain confidence in virtually all aspects of the interview and salary negotiation process with the most comprehensive resource on the market for up-to-date interview information. Utilize a turnkey, step-by-step lecture style program complete with done-for-you handouts, worksheets, quizzes and check sheets for your clients. As soon as you read it once you’ll be ready to teach, coach, and profit. Access resources for integrating these services into your program offerings with strategies for pricing, program outlines, sales techniques, and more. Then you just need this content and infrastructure to be able to step into effectively prepare your clients for the all-important interview, play a greater role in their success, increase your revenue per client, and dramatically boost your profits. I was visiting with a member who works with very high-end professionals in an outplacement capacity. Her gross revenue was over $300K at the time. I watched her in her PJs hold her 3-ring CEIC binder on her lap and read directly from it to prepare each executive client she spoke to that day. The color-coded script content in each module makes it THAT easy. When I first had the program proofread, the editor who was not a resume writer, came back and said, “From just reading through this program once I feel confident I could stand in front of a group, read from the materials, and no one would ever guess I wasn’t a pro”. Yes, I’m not exaggerating, it’s really that easy. I’ve also worked hard to incorporate all kinds of materials into it so that it’s effective whether you are working 1-1 at any level of client, or running a class or workshop. And, you’ll also feel fully supported through the sales process and incorporating it into effective packages that help you earn more per client without adding more and more hours of work to your week. The program is completely self-study at your own pace. You simply download each of the 18 modules as you are ready, print the material, and place it in a 3-ring binder to begin creating your coaching and training resource manual. Read the material and submit the assignment for credit via email. Your mentor will be available via email to answer your questions and provide feedback on your module exercises. Modules range from 3-32 pages, depending on topic. Exercises will take 20 minutes to two hours to complete. What makes this program so unique is that once you complete the modules, you do not have to worry about how to integrate it or translate it into client and practice value. You are provided with a revolutionary lecture style manual that is color coded to walk you through what to say, what to do, what to hand out or email, and when to do it! It’s completely self-contained and effective for all levels of job seekers. Individual and Group Coaching Outlines – pitch these services (and other career offerings) for transition workshops, seminars, or courses. Components of a Dazzling Trainer – effectively interact with different personality types and their learning styles. Ice Breakers and Openers – effective activities if you work with particularly challenging populations or are doing groups/workshops. Course Orientation Process – start a group or individual client off on the right foot to gain and keep attention, trust, and authority. Program Selling Strategies – effective sales strategies, script, options when they won’t buy, packaging, ways to convert one-off clients to groups and ways to get higher-priced individual coaching out of groups, pricing, and incentivizing. This module is worth its weight in gold as you will learn strategies to apply to your entire business! Bonuses – materials you can use including a PowerPoint Course Presentation and a Presentation for High School Students. Individual Pre Planning & Preparation Overview – strategies for phone interviews and using voicemail for a positive impression. Transportation – how it can count against your clients and what they can do. Wardrobe Planning – basics of preparing clients early on so they aren’t surprised later. Mind Preparation for Stress Reduction – ways to help clients stay calm and shine in the interview. Company Research – why it’s a secret weapon for interview success. Performing Company Research – the what and how of information gathering for companies large and small. Preparation Quiz – great way for you to help clients assess their true level of preparation. Telephone Interview Strategy – need-to-know content for confident, controlled telephone interviews. Portfolios – all the elements for assembling a portfolio and then using it effectively in the interview. Networking Cards – an effective leave-behind item or add-on to the client marketing process. First Impressions – it’s so much more than just clothing. Targeted Attire – dress for the company, the culture, and the job level. Attire Do’s and Don’ts Handout – handy checklist of what works and what doesn’t across the board for job interviews. How to be a Sesquipedalian – foundation for having concrete answers that paint pictures with powerful, tangible specifics. Baseball Strategy for Answering Questions – step-by-step strategy using a baseball diamond to hit a home run answer instead of a pop up. (You don’t have to enjoy baseball to see how easy this is for clients to grasp and apply over and over). What Employers are Looking For – show clients exactly what they need to bring to the table to impress interviewers. Self Analysis – perform self-assessment with effective strategy and a checklist. SWOT Analysis – apply this effective quadrant strategy to evaluate client strengths, weaknesses, opportunities, and threats. This is a very useful tool for helping clients to create a plan-of-action for being interview and job ready. It’s also a great coaching intake tool or strategy you can use for your own business. Maximizing Your Product – positive language that sells job seekers most effectively. Learn and teach the L+M=O methodology for winning presentation every time. Weasel Words – words and phrases that can crush an otherwise highly qualified candidate. Personality Type and Speedreading the Interviewer – great tool for matching answer delivery to the interviewer’s style. Body Language: What Are You Really Saying? – client quiz and content to make sure that body language reflects a positive, confident style. Definition of a 30 Second Commercial / USP – what it is and why your clients need it. Four Styles of Commercial – networking version, three-step qualification inversion, proactive product brand, and succinct two sentence advantage. Types of Questions – science, strategy, and examples for the following types of questions: enthusiasm, self-direction, communication, success-orientation, flexibility, and responsibility level. Fun Information – ice breaker stories to share with your clients to put them at ease. Dealing with Illegal or Difficult Questions – they are going to happen, so here’s what job seekers need to know to prepare. Types of Illegal Questions – understand and respond to illegal questions in a tactful and non-aggressive (or destructive way). Disability Questions – what to say/do when these are asked to avoid an uncomfortable situation. Incarceration / Criminal Record – ways to still have a chance with addendums, references, and positive responses. Employment Termination – turn a negative into a positive and don’t let embarrassment derail clients. Employment Gap / Spotty Work History – confident approaches to less-than-stellar work histories. Age Discrimination – strategies in language, body language, answering, and presentation that crush this. Under- or Over-Qualified – see how it’s all in the interview strategy. No College Degree – ways to confidently present without a college degree. Interview Dry Run – often overlooked steps to ensure your client is ready for the big day and will avoid any speed bumps. What to Bring to the Interview – process and checklist for all-important items your clients need to take with them to the interview. These will also give them an edge and confidence. When to Arrive – timing is everything as you can be too early or too late. Introductions – who your clients meet and how they treat them will set the stage for the interview. The One-On-One Interview – walk-through of this interview model. Questions to Ask the Employer – clients will leave selfish ‘what’s in it for me?’ questions when they prepare in advance with a list of targeted questions. This shows how you don’t have to memorize and can actually use a written list to appear savvy and prepared. Closing the Interview – ways your clients can exit the interview demonstrating interest and armed with knowledge of next steps. Alternative to the Traditional Interview: Take Control – when the interview goes askew, how to bring it back on track. Prepare a PowerPoint Presentation – visual ways job seekers can stand out from the pack. Ask for a Problem – hands on ways job seekers can show vs. tell, when speaking may not be a strength. Get the Grand Tour – showing interest and getting into the company on a higher level. The Stress Interview – clients won’t stress the stress interview when they have a chance to prepare for it in advance. The Good Cop / Bad Cop Interview – preparation ensures your clients won’t get trapped responding to good cop/bad cop interviews. The Panel Interview – ways to stay on top of lobbied questions from multiple interviews with ease. The Hands-On Interview – what to do when the interview involves an activity. The Wear You Down All Day Interview – steps for staying fresh, positive, and consistent in all-day interviews with multiple interviewers. The Cattle Call Interview – steps to stand out in the crowd and maximize this group interview. The In-Box Exercise – what it is and how to perform. The Long Distance Interview (Travel) – bloopers to avoid to have a positive long-distance travel-included interview. The Videoconferencing Interview – easier today than in the past, but still tricky in regards to what to wear, where to look, etc. The Virtual Bot Interview – yes, artificial intelligence has entered the interview scene! Chat-Based Interviews – this is gaining popularity with recruiters and has its benefits. The Lunch Interview – what to do and not do to nail a lunch interview. The Interactive or Fishbowl Interview – get down to what employers want and how to respond to this type of interview. The Puzzle Interview – typically reserved for technical interviews, this type of interview has a unique strategy and some critical elements to master. Overview + Application Addendum – steps to prepare clients with an addendum if something is going to come up in a check. Background Checks – reasons for background checks, investigated issues, what employers can’t check, confidential records, employer reference checks, notice of a background check, how to prepare, and how to respond to bad news. Drug Testing – typical tests, hair testing, false positives, and what to do. Follow Up – why, how, and when to successful follow up. Thank You / Follow Up Letters – contents and key points for making interviewers remember clients, and for overcoming less-than-stellar interviews. (It’s not too late to turn a bad interview around). Alternatives to the Traditional Letter – steps to take that go above-and-beyond the letter to earn brownie points for candidates in the selection process. What’s Next – waiting, follow up, and the squeaky wheel. The Dreaded Question – effective salary survey and self-pricing. Dissecting the Offer – considering primary benefits as well as additional perks and benefits. Negotiation and Offer Evaluation – the how-to of negotiating an offer on the table, and how to evaluate it with a handy checklist. Multiple Offer Comparison Chart – chart designed to review and compare two offers simultaneously. Employment Contracts – when they come up and how to make sure they are favorable. Anyone who wants to be able to educate clients (and even employers) in interviewing and salary negotiation. This includes Transition Specialists, Placement Specialists, Resume Writers, Career Coaches and Counselors, Job Developers, Career Industry Authors, Recruiters, and other career professionals. All modules in PDF. Simply print them out to create your color coded manual. Entire program in MS Word for easy reproduction of handouts, quizzes, and worksheets. Instructions for creating attitude flags for adjusting client behaviors. 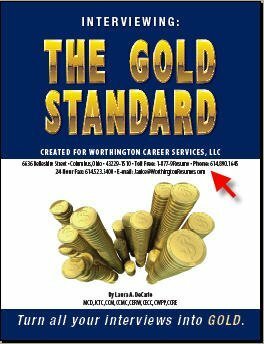 1 copy of Interviewing: The Gold Standard, the client companion book to the program This 172 page book retails for $49.95. They are printed, book-store quality books and can be sold to clients or bundled in packages to truly add professional value. Note that these can be later purchased with personalized covers that list your business information (scroll down for a closeup of the custom cover and for more information). Note: An additional fee may be required for shipping of the sample workbook to international addresses. The CEIC certification must be renewed every three (3) years by purchasing the program update modules. Depending on new content, there may be 1-5 modules released at $21.95 each. All requirements of CEIC certification, renewal, and CDI membership standards must be maintained in order to earn and retain a CDI credential. CDI reserves the right to revoke a CEIC credential for any of the following: Renewal requirements are not maintained and completed within required timelines. Membership lapses due to non-renewal. Individual is found guilty in a court of law for a grievance within the industry (unprofessional, unethical, unlawful conduct and/or business practices). If you are a graduate of CDI’s CEIC program, then you have the ability to purchase custom-cover copies of Interviewing: The Gold Standard, which retails for $49.95, and is great for including in your packages, 1-1 interview coaching, classes, outplacement workshops, client gifts, or individual sales! The content goes along module-by-module with the CEIC program, so clients can follow along or be assigned activities based on the corresponding module to the CEIC program. Plus, the full-color, glossy, custom cover creates a unique branding opportunity for your business. Sample: Custom cover content can include your name, company, address, phone, email, fax and website URL. Sorry, no logos or graphics. There is a 1-time $15 setup fee with your first order. Proofs will be sent for your approval. Interviewing: The Gold Standard is available for wholesale at $12.95 + shipping. For quantities of 35 or more, discounts are available. To request a quote, please send the number of copies you would like to purchase, your mailing address, and phone number to info@nullcareerdirectors.com. For more information on the CEIC credential, contact CDI at info@nullcareerdirectors.com. 1. I was given a mentor who not only wanted to help me with the certification process, but, more specifically, wanted to help me grow my business. She helped me set goals, talked to me to see how I was doing, and gave me the confidence to raise my prices. 2. My mentor gave me positive feedback during the homework process and encouraged me to grow in places I never thought I could. My dear colleagues, because of my age, I didn’t know how far to go and as my mentor so kindly pointed out, you are as young as you feel, and maturity is something that is needed. 3. My career coaching is off the ground now and moving. I am giving talks to groups, both pro bono and for fee. 4. I am published in the paper and am free to use the many handouts that came with the lessons. If I had it to do over again, I would have come up with the money to pay for all of the printed material because I think that would have helped even more. This is the most comprehensive, down to earth class I have taken. This is a wonderful group and I have increased my business more this year than in the 5 previous years, even with the downturn. I was excited to discover Laura DeCarlo and Career Directors International. I had wanted a certification for interviewing for quite some time. Yet my searches found no group, nor individual, who could deliver the training I believed was necessary. Until discovering Career Directors International and Laura DeCarlo. First, Laura and CDI’s goal is to help make you successful. And she works hard doing just that. Incredibly knowledgeable, and highly experienced, Laura shepherded me through the in-depth CEIC training necessary to help me confidently and expertly move forward guiding my own clients through the process of professionally handling the interviewing process. Words cannot express how grateful I am to Laura for sharing her years of experience and expertise. She not only steered me through the program, but advised me on a variety of other valuable and related topics. Laura is an excellent trainer and can be relied upon to be there for you every step of the way. The CEIC program was the most concise, broad-reaching interview instruction manual I have ever seen. It goes beyond teaching the client to ‘tell me about yourself’ and hits strategies and ideas that can be applied across the board to most clients. I began implementing the ideas into my practice immediately. The CEIC has paid for itself, not only in terms of profit, but in marketability, and professional knowledge base. I am a big workshop / teleclass girl, and have plucked most of my classes straight from the CEIC training modules. Having this certification allows me charge money for a class and get it because I am an expert in interviewing. It also enables me to successfully coach clients, who in turn refer me to their friends and even their new employers. Those skills I learned from the CEIC. I have gained huge benefits through the CEIC certification process at CDI: Confidence, Clarity, Customer appreciation and Connections! Each module explains, trains, and creates usable scenarios to use one on one or in seminars. Handouts that can be personalized to accommodate the lessons are just one of the many benefits. Instead of reinventing the wheel, I was given a road map to plot my client’s destiny. I liked the fact that I could work at my own pace, asking questions and moving forward without penalties. My goal was to become an expert ASAP, without sacrificing knowledge or legitimacy of the program. I know that my CEIC brings me credibility with my clients and my peers. Learning and growing is paramount to success. How can I expect clients to hire me without demonstrating it myself? I always encourage colleagues to invest in their future by gaining certifications through the CDI. I am also happy to recommend the CEIC. 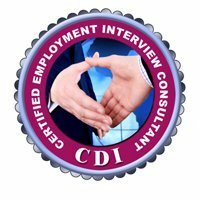 Interestingly, just before the CDI conference, I had a potential client call and say that he had a big interview and needed interview coaching that Tuesday. I was swamped and turned him down, but he begged me to please give him an hour phone session. With no time to prep, I winged it with my CEIC turn-key manual on my lap. It went very well, he was passed on to the next phase of interviews, and he got the job. Happy client! I just held an interview workshop using my CEIC and CDI’s program today for a non-profit company who supports young adults who were foster kids. It was a great success! The youth were totally attentive and gave me hugs. Thank you Laura and CDI for your wonderful program. I was selective in what I used for the presentation. I feel really great today because I saw their eyes open wide to what I shared with them. I highly recommend Laura’s CEIC program. I am making money too! – Anita Radosevich, Career Ladders Inc. Your CEIC course was fabulous! I thought the modules were on target with today’s ever-changing world of work. Your questions for credit were both challenging and at times made me chuckle. Many of the questions are day/day scenarios I encounter in my staffing business. I believe that every day we should learn something new and I sure learned insight into taking the CEIC. – Catherine Palmiere, President, Adam Personnel, Inc. and Adam Temporary Services, Inc.